Entourage Jazz Wishes You A Cool Yule! 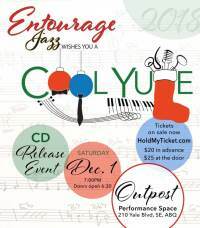 Join the Big Band Sounds of EJAZZ as we release our holiday album, "Entourage Jazz Wishes You A Cool Yule!" We can't wait to celebrate with our incredible fans with a concert and party at the Outpost Performance Space! Check out the Outpost at 210 Yale, SE.